Summer has arrived. Can I get a whoop whoop? ... Time to pull out my summer essentials from lotions and sunnies to magazines and an array of rainbow nail polishes, let the bathing commence. My once indulgent (yes I'm using that word) essentials have been replaced with 'don't even think about forgetting" baby must haves. Gone are the days of perfecting the perfect tan and wasting the days away (sad face), they are now spent keeping Henry from burning or cracking his head open in our very un-child friendly garden. 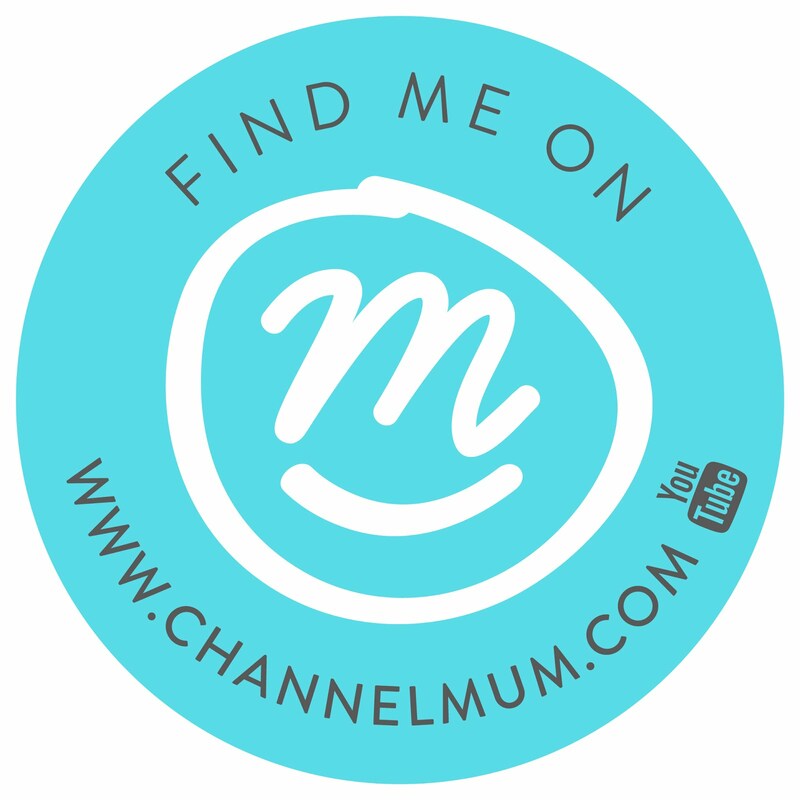 So without further ado, here are my Top 10 tips for protecting your Little Monkey's from the sun. Once upon a time I thought anything over factor 0 was a crime against the sun gods. I've thankfully traded up since then, however even my factor 20 isn't strong enough to protect Henry's skin. This week alongside my my Mother & Baby magazine, I received a tester sized suncream and after sun lotion from Child's Farm. Henry of late has been suffering with eczema and unfortunately like his Mummy has ultra sensitive skin. However I was intrigued when I read that Child's Farm uses natural ‘free-from’ ingredients and essential oils to produce mild, kind and delicious smelling toiletries that will keep Little Monkey's skin hydrated. The Suncream in particular has a 50+ SPF rating and went on like a dream onto his skin. Its super thick too so you can see any parts you have missed. Henry loves wearing his hat (everybody loves wearing a hat... sorry Peppa Pig rules my life). Little Moo quickly learnt that if he wears his hat, he can play outside or better still splash in the pool, therefore he mostly keeps it on. On the downside, when its time to come in, he tantrums like mad and tries to force the hat back on in protest. Ahh building memories. This cute little fisherman's hat came as a two pack from Next. One of the advantages of having zero gardening experience, is our overgrown Jamanji garden has created perfect little canopies of shade. Using Henry's giant letters floor mat, I created a little play area away from the sun. I also ensured Henry kept his hat on as the sun can still peeked through the forrest. No crawling around the pool (hehe). 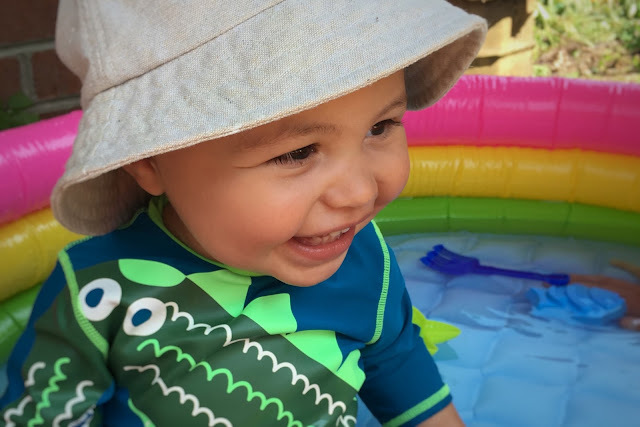 This week I picked up two gorgeous little all in one swimsuits for Henry's holiday and was over the moon I got to try them both out this weekend. Firstly the Sainsbury's Later Alligator swimsuit with printed front and zip back kept the main part of his body out of the sun. I loved the vibrant colours and it fitted him perfectly (size 12-18 months). Currently £4 (cue bargain loving emoji, there isn't one? well there should be). Next up was the above nautical number from Mothercare. If you frequently read my blog (hey Dad) you will know I'm obsessed with stripes, so this style was a no-brainer. Slightly on the pricier side at £14 and coming up slightly smaller (1 1/2 - 2 years) it was still perfect for protecting him from the sun and it also held rather well when Henry decided to poo in the pool #NappyOffProblems. For Henry's 1st birthday he received a great little sandpit set from his little friend William and soon as the sun came out, I filled it up with water. Henry loved it instantly, it took him all of 10 minutes to climb straight in, creating his own little jacuzzi. I instantly knew he would love a little paddling pool and drove straight to Smyths to pick up this rainbow number. Henry was literally a little raisin the time he wanted to get out and I enjoyed sitting and watching him play (vs. running around the house saying, "Mummy said No". I don't know whether it was teething, Henrys current medicine for his eczema or just purely the heat, but he had no appetite at meal times. Rather than stressing with each failed mouthful, I found that offering little bites throughout the day, ensured Henry kept fuelled with food. Everything from fruit, little breadsticks, pesto pasta shapes and tomatoes (the kids loves tomatoes) were all little savours. I also found that feeding him in the pool offered a little distraction. On the downside, Henry will now only eat his tea in the bath. I loved watching Henry play in the water splashing about, however when it got particular hot, it was time to bring the little guy in. Cue screaming tantrum and hat throwing. However once he cooled down inside, he was happy playing with his toys. Henry happily went out again later in the afternoon and the air was much cooler. This isn's so much a protection tip, it's more of a, you've so gotta do it tip. Henry is still in his baby bath as we only have a shower in our house. Therefore we just popped it outside and Henry enjoyed his 3rd pool experience of the day whilst soaking in Aveeno bath oil. The Aveeno is perfect for his eczema, but also great for hydrating his skin after a day of sweating. I also covered him in cream when he got out.